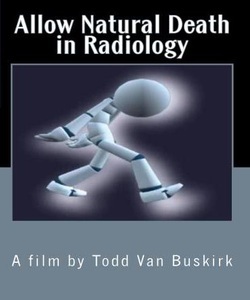 Allow Natural Death in Radiology - Todd Van Buskirk. Artist. What if Andy Warhol was an animator and directed a film at Pixar? The result might appear as Todd Van Buskirk's "Allow Natural Death in Radiology." This film is 1 hour, 9 minutes, and 44 seconds of an animated walk cycle. No more, and no less, except the radioactive light animating off the character slowly gets brighter as the feature progresses. Van Buskirk started this project some years ago with an assigned animated walk cycle assignment in college. Van Buskirk was given a 3D modeled character to animate using Maya software. The essence of the assignment, which earned a "C", was animate 15 seconds of a walk cycle. This basic idea survives in the finished 80 minute feature. Animation as junk, animation as detritus. Nutritionless animation, meaningless animation, unloved animation. Animation built on illegibility, unreadability and machinistic repetition. Animation as material, animation as process, animation as something to be shoveled out machine-like. Animation is more about quantity than quality. Boredom, valuelessness, and nutritionlessness is the ethos of this new type of animation, this animation of the future. It is a future that lies in the use of aplastic, objective and entirely non-animation procedures. Anti-animation will make no claims on originality. On the contrary, it will employ tactics that would be intentionally self and ego effacing if employed by a human. Uncreativity, unoriginality, illegibility, appropriation, plagiarism, fraud, theft, and falsification. You don't need to generate new material to be an animator. The intelligent ordering or reframing of existing movement is enough. Most regard Animation at the level of movement. Movement that is subordinate to the ideas and the entertainment we associate with the genre. But animation can work at many levels. You can think of movement not merely as an invisible medium but as physical matter. Movement that has to be moved around, processed, stored, manipulated. Movement as a quantity of frames. Movement that merely takes up space—that both creates space and fills space. I am most interested in animation as physical matter, something that you manipulate and build. Filling up space with movement. Andy Warhol said quantity is the best gauge on anything (because you're always doing the same thing, even if it looks like you're doing something else). That's the way animation will be in the future. No longer will you watch animation; you will just think about it. The thinking will be better than the watching. Some people would say that's already the case with my movie, "Allow Natural Death in Radiology,” a movie that no one in their right mind should ever try to watch in its entirety.